Which Sector is in Uptrend Now to Make Money? As we have repeatedly stated that one can make money in stock market by just being vigilant in the market and just identify the sector which is in uptrend and find the leader in that stock and then go for it with a strict stop loss. Till now tyre industry was in the uptrend and now cement sector is the flavour of the month and these sectors keep changing and thus you have to be dynamic in the approach. Check best tyre stock to buy to make money. Have a look at leaders in the cement sector and names of ACC, Ambuja cement comes to the forefront. We had earlier covered that why India Cement will show an upmove now and readers have benefitted with the trading strategy. Have a look at the stock charts which will show you that cement industry is on the up move. We present below the screenshots for ACC and Gujarat Ambuja cement for you to see how uptrend remains in force. 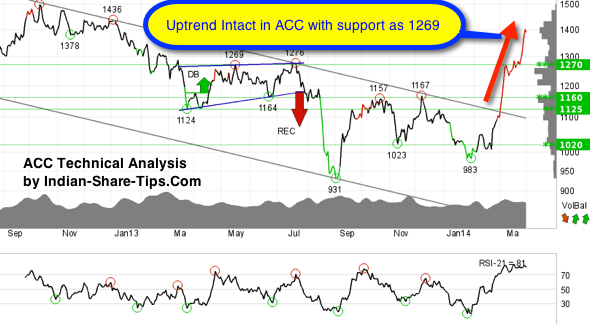 As you can see that ACC is in uptrend with support as 1269. 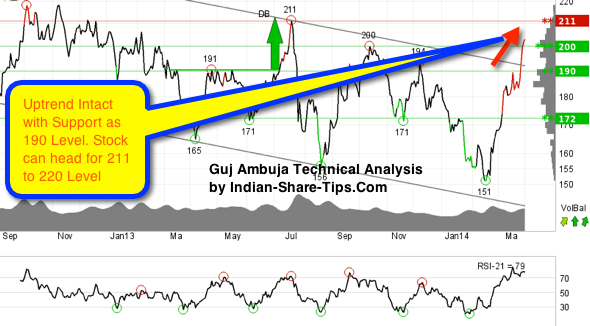 Gujarat Ambuja cement stock is between the support at rupee 200 and the resistance is at rupee 211. A definitive break through of one of these levels predicts the new direction and thus one has to be dynamic following the breakout stocks. Break of 200 level means that stock will find support at 190 level. Wanna make money like professionals in intraday then you can not afford to miss the best intraday tip which finish with in first 2 hours of the day and none can match the returns by holding for 5-8 days by going in for delivery tips as aim is to trade less but accurately.